As the smell of hot dogs, hamburgers, and chicken kebabs filled the air, the pounding of a drum vibrated throughout the backyard. Huda Hidar rhythmically slapped the hand drum perched on her lap, keeping the beat as those sitting around her began singing a Syrian song. Instantly, Rabbi Andrea London recognized some of the words. “We said, ‘Oh this song sounds like a Hebrew song!’ and we’d sing along in Hebrew, not understanding each other,” London says. Another song had both “salaam” and “shalom” in it – “peace” in Arabic and Hebrew, respectively. “Even though we don’t necessarily speak the same language, there’s a connection as human beings,” London says. Susan Fisher and Jonathan Yenkin joined Evanston’s Beth Emet Synagogue in 2001. On its website, Beth Emet describes itself as The Free Synagogue, which “seeks to create a spiritually vibrant, socially conscious, intellectually challenging, and deeply caring environment firmly rooted in Jewish tradition and values.” Beth Emet’s roots in social action date back to a talk Martin Luther King Jr. gave at the synagogue in 1958 and spent the night at Beth Emet because no hotels would rent him out a room. When Fisher and Yenkin began the application process to mentor a Syrian refugee family, they instinctively reached out to the Beth Emet community. “Part of the synagogue’s DNA is to be socially active,” Yenkin says. Finding themselves deeply troubled by the narratives presented about Muslims and refugees on the news, Fisher and Yenkin decided to take action. They filled out an application to become a mentor through the Syrian Community Network (SCN), a non-profit organization founded in 2015 by Suzanne Akhras Sahloul, which partners with refugee resettlement agencies to provide support and mentorship to newly-arrived Syrian refugees in Chicago. After a training hosted by SCN and a background check, they were ready to mentor a family. They took on a short-term mentoring experience in early 2016. It went so well that Fisher and Yenkin waited to see if SCN would match them with another family. At the time, SCN was working with only 25 refugee families. With a dramatic influx of Syrian refugee families into the Chicago area in the summer of 2016, SCN quadrupled the number of families that they were serving, says Maya Atassi, Programs and Development Coordinator of SCN. Hidar and her children were one of those families, and in October of 2016 they met Fisher and Yenkin for the first time. 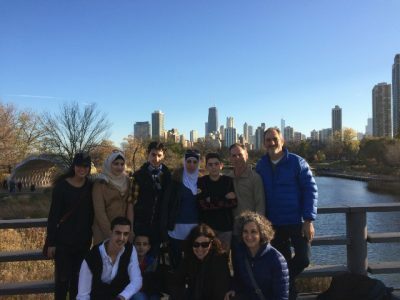 Hidar had moved to Evanston with her daughter, Yara Qatan, and four sons, Mohammed Qatan, Ahmad Qatan, Abdalrahman Qatan, and Khaled Qatan, two months earlier. While living in Syria in 2013, Hidar was struck in a bombing by a piece of shrapnel that required surgery. While she was recovering in the hospital, a chemical attack claimed the life of her husband and her oldest son. Fisher and Yenkin, along with a group of five Beth Emet congregation members, have been instrumental in helping Hidar and her family acclimate to their new home, supplementing rental costs for their Evanston apartment, and finding Hidar a job at a food preparation company. 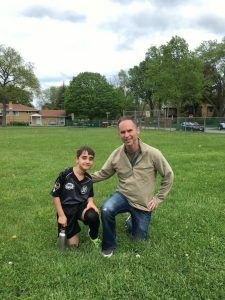 The community also raised more than $5000 in an online GoFundMe campaign to help supplement the rent for Hidar’s apartment and helped register the two younger sons, Abdalrahman and Khaled, to play with the Evanston American Youth Soccer Organization (AYSO). One cloudy Sunday morning, Khaled dribbles the ball down the field and laughs with his teammates after launching the ball comically far from the goal. Yenkin and other parents chat and coach the team from the sidelines, offering the boys water and tending to any minor injuries. The first 100 days of the Trump administration have proved to be difficult for immigrants and refugees across the country. When President Trump’s executive order regarding immigration came down and effectively sought to ban immigrants and refugees from a host of Muslim-majority nations from entering the country, Hidar knew she had to take action. Along with other members from the Syrian Community Network, she went to protest downtown and was interviewed by Chicago Tribune reporters. “Huda is very active,” Atassi says. “She said, ‘I wanted people to hear our story.’” The Tribune has interviewed her again to discuss President Trump’s stance on refugees. Chicago, with its reputation as a city of immigrants, has turned out to support the Syrian Community Network despite Trump’s continued peddling of xenophobic rhetoric toward immigrants, Muslims, and refugees. Organizations across Chicago have reported volunteers showing up in droves within Trump’s first 100 days, ready to help in whatever ways they can. While the majority of Trump’s campaign promises remain unfulfilled, two of the most pressing concerns for Chicago’s Syrian community have been Trump’s executive orders against immigration from Muslim-majority countries and the repeal of the Affordable Care Act. Similarly, many people in the Syrian community had relatives or friends who were supposed to follow them to the United States. Salam Abdulrazzak, Executive Assistant & Administrative Coordinator for SCN, says that when Trump’s executive orders were initially put into place, community members were confused and afraid. Fisher sees a gap and a disconnect between the current government leadership and what the people really feel, and is working to fill that gap in a very personal and emotional way. Fisher’s role as a mentor for Hidar and her children ties closely into her own family’s history when they arrived in the United States. Neither Fisher nor Yenkin speaks Arabic. This language barrier between the two families doesn’t quite allow them to discuss complex topics, such as religion or politics. When Hidar first met Fisher and Yenkin, their encounter with the language barrier was in trying to get Hidar a washing machine. After they learned that Hidar had been washing her clothes in the bathtub of the apartment, they were able to communicate enough to make arrangements to go to the laundromat once a week with her. While members of the Beth Emet community serve as translators for more serious matters, Fisher and Yenkin are for the most part able to get by with the help of an occasional Google Translate search. The language differences don’t hold the families back from having a meaningful relationship, though. In the time that the two families have spent together, they have found common ground with small discoveries, such as Arabic and Hebrew words sounding the same or the similarities between Halal practices and Kosher laws. These unexpected cultural reflections, as well as making jokes and simply hanging out, have allowed for both families to understand one another. For both Yenkin and Fisher, the experience of mentoring a Syrian refugee family has been one that they say has enriched their community and given an intensely tragic situation a personal impact in their lives and the lives on those in the Beth Emet community.